Hand blenders have seen a lot of improvement over the years. Now, they are lightweight, comfortable to hold and work faster and better. Nevertheless, there are too many choices on the market that makes it very confusing to find the right one. You can use a hand blender for blending and whisking many things. It is quick and easy to use as you can just insert it into the mix and press the button. It blends the content right there in the container without any need to transfer the ingredients to a blender-specific container. When compared to regular blenders, hand blenders are designed for quick blending. They are also relatively cheaper. The only way to go about getting your money’s worth is to invest in a quality one, isn’t it? What Makes a Quality Blender? A reliable hand blender should have a powerful motor, strong blades, and quality overall construction. Most of them also include a whisk attachment. Some may have other accessories as well, but extra accessories also add to the costs. More than the accessories, you also need to look out for the warranty as it makes it for a safer purchase. Should anything go wrong, a warranty can guarantee you a replacement. Here, we have a hand blender from the popular brand Braun. Let’s review its features and look at its pros and cons to find out if it is a right fit for your needs. The Braun MQ505 features the one of a kind PowerBell technology. It is basically a bell-shaped blending shaft containing stainless steel blades. These blades are highly sharp and durable, and they can blend like a heavy-duty blender. There are two speeds: a standard and a turbo charge one. The latter supplements more power for quicker and easier blending. The attachments can be removed and attached using the one-click mechanism. There is a whisk attachment included as well as a 20-ounce beaker. This is spacious enough to blend most things in the kitchen. You can easily clean it with just a rinse and continue with the next blending chore. The handle has a soft rubberish grip that does not even feel too strong when held. You can just hold it normally, and it will stay in your grip, firmly blending through whatever it is that you need to blend. The ergonomic grip makes it a highly user-friendly hand blender. It is efficient but also looks cool in your kitchen due to its eye-catching design. 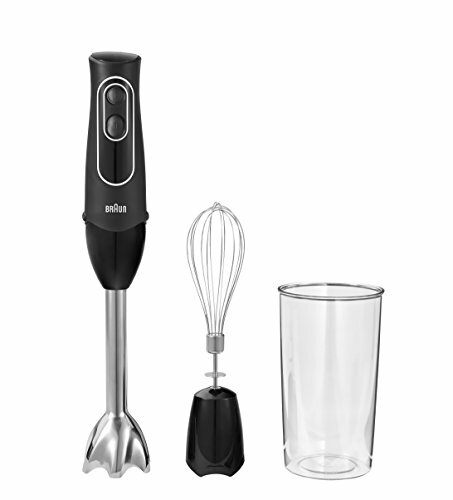 This black colored sleek hand blender takes very little space and looks quite stylish. In addition to that, it is also super lightweight, weighing just around 1.59 pounds. You will not feel a thing when holding it in your hand. This hand blender boasts a 350-Watt motor, which is more than powerful enough to blend or whisk quickly and efficiently. It is not your average kitchen appliance motor, but a German-engineered motor that will last long. The Bruan MQ505 is a fast, efficient, and easy-to-use hand blender that comes with a beaker for hassle-free blending. The high-speed motor ensures even the toughest of ingredients get blended finely, thanks to the fact that it has two speeds. You can put on the whisk attachment in just one click too! Made using high-quality materials, it is a sturdy hand-blender that is also comfortable to hold in your hand. There is a turbo charge button that basically gives a power booster to the blades. It takes a bit more effort to press, but it gets the job done. The blades have a patented design from Braun that works faster and better. Braun has produced a sturdy hand blender that is also pretty simple. However, let’s compare it with another blender to see its worth truly. One similar product is the KitchenAid KHB2351CU 3-Speed Hand Blender. It is very much the same as the Braun model, but there are few differences as well. First of all, the KitchenAid hand blender’s motor has quite less wattage. It is only 85W and gives three different speeds. The KitchenAid hand blender comes with multiple accessories though. It has its own whisk attachment and beaker, as well as a small food processor/chopper. This is just an extra accessory that can be used to chop hard stuff before blending it. Regardless, in terms of power, the Braun MQ505 comes out on top. The KitchenAid hand blender, which weighs two pounds, is also heavier than the one from Braun one. However, that is not a very significant difference. Both have high-quality motors that can work for long durations without any hassle. Similar to the Braun hand blender, it also has a warranty to ensure customer satisfaction. Other than the ones mentioned above, there is no other significant difference between the two. There is no big price difference either even though there is a small food processor in the KitchenAid KHB2351CU package. The hand blender from Braun is truly amazing given its ease of use, power, and design. You cannot really go wrong when choosing a product from Braun, which is considered a reliable kitchen appliance producer. Also, its price is not high considering you will easily be using it for years in your kitchen. Instead of going for blenders that offer multiple speeds that do not even seem that different, go for this simpler one. There is not much going on as there are just two buttons: one for normal speed and the other for turbo charge. This reliable hand blender is very highly recommended for both home use and professional kitchen use or anywhere where time is very valuable. This will give you the fats blending you need in such a setting.